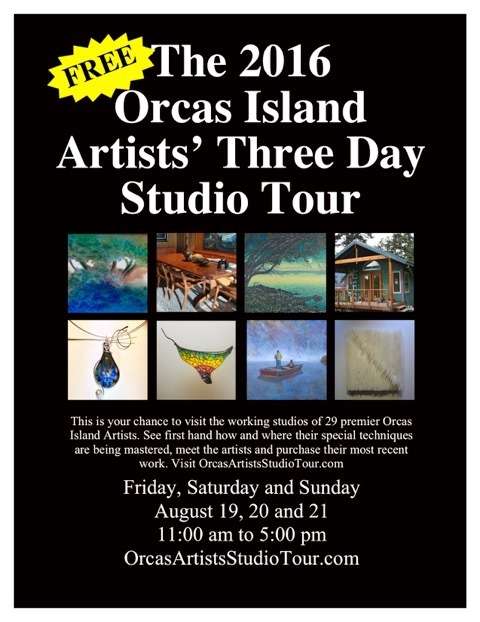 Ina Drosu, Studio #10 in Deer Harbor, is an Artists’ Tour favorite. This year, Ina will show many examples of intriguing reverse oil paintings on glass, including gilded bowls and tiles, and Venetian plaster paintings that have a distinct old world air. Her studio work includes Venetian plaster as an architectural element, since the other hat Ina wears is as architectural plasterer, gilder, traditional faux finishes painter, and Interior Designer. More of Ina’s work can be seen on her website, but it will surely be more interesting to view up-close the possibilities she can create for you and your home this weekend, at her studio.